Penny Pizza is one of the better clones of Pizza Hut in the market. 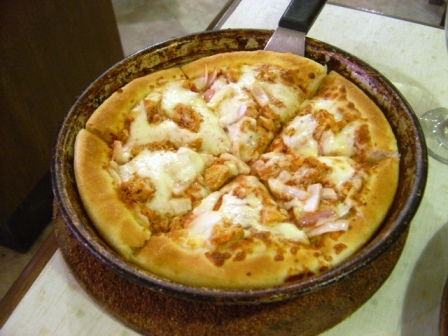 In fact when it first started out a couple of years ago, it outdid even Pizza Hut in the quantity of the topping. Since then it has come back to Earth and doing what most Pakistani pizza parlors are resorting to, specifically minimalist topping. In spite of all that, Penny Pizza is going strong. We checked it out on a Friday night after almost a year of first testing it, and the joint was doing good business even though it wasn’t exactly the weekend. There have been loads of pizza parlors that closed shop in the first six months of their life. Penny Pizza continues to egg on. One of the reasons for its success is that it’s following Pizza Hut not only in the product part, but the promotion part as well. It brings out attractive deals every now and then. The most recent one was the Pan Pizza Deal at Rs.119 and the Midnight Deal, before that it was the Valentine’s Day Special and so on. What we tried on that particular Friday night wasn’t exactly a special promotional deal. It sounded more of an ongoing meal deal, the one you find at almost every fast food joint these days, which just bundles a couple of products together at a minimal discount. We took two regular deal specials, each one included two regular pizzas of your choice plus 1.5 litre soft drink for Rs.650+ GST. All in all it looked to be a fairly good deal until the pizzas arrived. They were just a wee bit larger than the smallest pan pizza, just enough for an average appetite person. We let the person serving us know what we felt about this, and his reply was that they were the standard 9 inch pizzas. We didn’t however, start measuring the size, which would have been the next logical step. In essence, that deal is good for two normal adults. Add a third, and someone would remain unsatiated. The bottom line is that Penny Pizza needs to do something about the size of the regular one. Either increase the overall size or load the crust completely with meat,cheese and whatever flavor the pizza is intended to be. 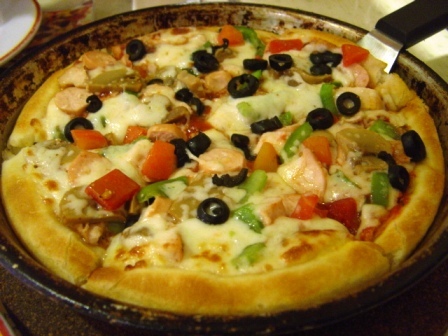 Coming back to the topping issue, the pizzas were devoid of equal topping on the far corners of the crust, which has become something of a rule with all the pizza parlors. And herein lies an opportunity for a restaurateur to come up with a brand that positions itself specifically in this particular niche of pizzas that are covered from ‘head to toe’ with lavish toppings. It need not have a heavenly divine taste, just enough to be acceptable by the consumer. It can then boast of offering huge amounts of topping and deliberately under-position the competitors, even the market leader in this regard. It can then say that it doesn’t offer the extra topping option because it’s normal is more than enough. Just imagine what would that do to the competitive dynamics in this market? It would tip the level playing field in the favor of this new challenger. So if Penny Pizza has all the shortcomings of the other pizza parlors, what makes it tick? 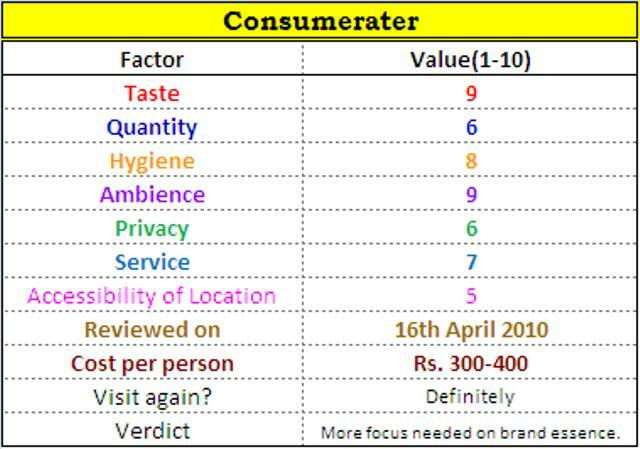 What makes the consumer go back to the place again? Two major reasons. One, it emulates Pizza Hut’s taste quite well without charging premium unlike some of the other clones. Secondly, in spite of the ‘open spaces’ on the crust, it still offers the best amount of topping against most competitors. 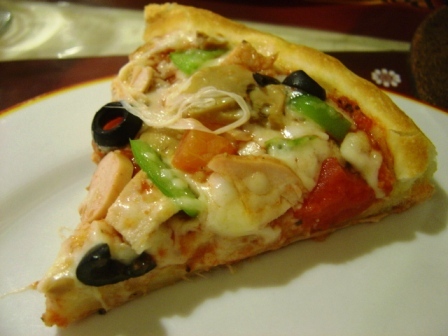 The topping has sizeable chunks of meat and the works, although the quantity of cheese has declined. A third less known reason is the taste of its crust. Most pizza parlors including Pizza Hut itself have a crust that’s just average. Penny Pizza’s crust is soft and actually has a taste of its own that you don’t mind gobbling it even if it’s bare at some areas. Then for a restaurant located in Gulberg, it has done well to keep its ambience aesthetically pleasing and upscalish. Although we didn’t try its chicken wings, they are highly recommended by some customers. We did try their pasta and lasagna and it was nothing to write home about both in terms of quantity and taste. Its specialty is basically its pizza, and it would do well to focus exclusively on it and do away with items that do not build its brand essence. Instead it ought to increase the number of flavors of pizza. 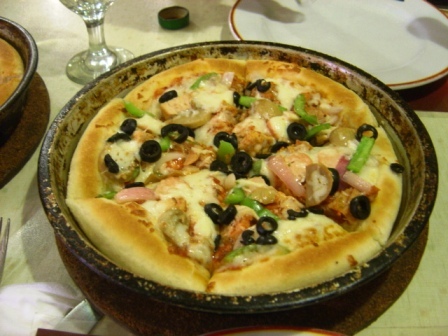 Right now it’s offering the usual flavors of Pizza Hut but with different names. For instance the Chicken Supreme is called Chicken Max. There was, however, one disturbing thing about all the chicken pizzas. The chicken used in all the flavors had the same taste. In fact it was the same marinated chicken with no variation in recipe. For some flavors you could accept that, but when you use the same recipe of chicken you are using in chicken Fajita in Chicken Tikka as well, then that’s criminal. 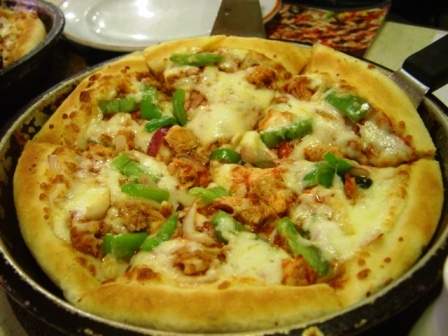 If you’re ordering chicken tikka, you expect to get served a pizza with chunks of chicken boti which is actually barbequed. Sadly this wasn’t the case at Penny Pizza. It’s better to not offer something which you don’t have than to deceive the customer. In the short term this may boost sales, but in the long run, it wreaks havoc with your brand worth. Coming to the marketing and branding part, Penny Pizza is doing fine, in fact it’s success has largely to do with its marketing efforts. 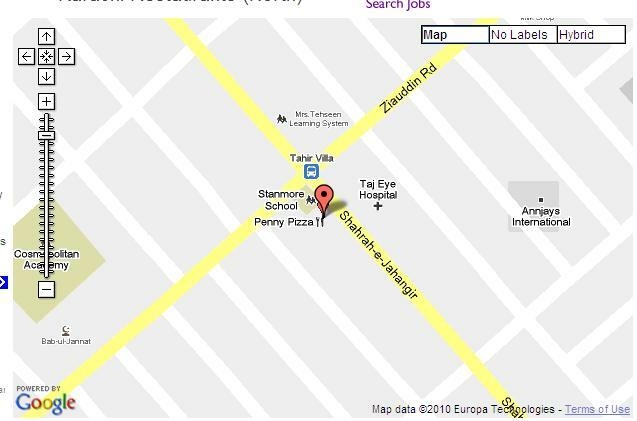 Do a google on it and the top 10 results would be saturated with the local penny pizza although there is one foreign brand as well with the name penny’s pizza. Like most of the new restaurant upstarts, it has a facebook profile but unlike most of the them, it has neither many fans nor much activity from the few fans it does have. At 262 fans, it is far behind brands like 1 on 1 and Café Studio which have fans exceeding 10,000 and tremendous amount of activity. So overall it can afford to be a bit more aggressive on facebook, not that more fans necessarily transform into more sales. One on One has more than 10,000 fans and yet it gives a deserted look on most days of the week. One thing Penny Pizza should definitely do is keep track of the numerous international days. If it’s a Father’s Day, come up with some special promotion tailored to it. If it’s a cancer day, offer to deliver free pizzas to the children’s ward of a cancer hospital as part of Corporate Social Responsibility (CSR). 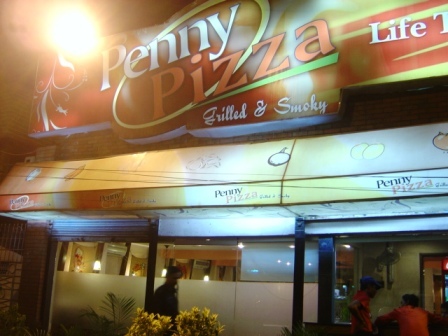 Penny Pizza has definitely carved out a niche for itself in a short span of time. What it needs to do is stay true to its initial honest offerings and experimenting just enough to keep not only the crowd coming in but the first time customers returning many times over. Quite a good review thanks!! i have tried their chicken wings apparently they are more spicy then those offered at Pizza Hut. I totally agree they are a bit stingy on the toppings and they should put a butter scotch paper at the bottom of the box or some plastic so that the pizza does not stick at the bottom. I was stunned at this answer and enraged (yes i am a short tempered man) i took the whole pizza and dumped in the nearby dustbin and shot a one thousands note on his face and marched out of that pathetic place. I wont go ever in that ***** place again. I would agree with Mr. Adil khan. They have started compromising with their service and Pizza Quality. Unfortunately, most of the eateries are resorting to such tactics, both local and foreign.